Hey, Kitties, it’s finally Friday and time for a feature Friday film. I thought I would end this week with some paw-smacking humor. As you all know, cats have a kind of comedy that it takes special humans to understand. The video I have selected is a purrfect illustration of cat humor. I hope you enjoy it. Meow there. I have another interesting guest here today. He’s had a little trouble fitting through the door, but I helped him squeeze in. Hello there, big guy. Can you please introduce yourself and tell us the name of your author? I’m Quincy and Janet Cantrell writes about me. She calls me a Fat Cat. Fat Cat at Large, Fat Cat Spreads Out, and Fat Cat Takes the Cake, all cozies. You can see that I’m the main character, right? I certainly can. I’m a cozy cat myself. Please tell us about your series. My human is named Chase, and I think that’s because she’s always chasing me. No wonder I sneak out as often as I can—she has me on a strict diet because she thinks I’m too fat! She’s beginning to wonder why I find dead bodies sometimes, but I also find clues that help her track down bad people. She and the police should give me a medal. A catnip metal. My human owns a dessert bar shop in Dinkytown town, part of Minneapolis, and the co-owner, Anna, is a special friend of mine. She ignores Chase, being much older and wiser, and gives me treats all the time from the things she’s baking. Yum! No wonder you have trouble controlling your weight. There are so many bakers in Cobble Cove. If I ate Dora, Gilly, or Claire’s baking, I would be too fat to fit on the page. Are you based on a real cat such as your author’s? If so, please give further details. Janet, the author, says her cat Agamemnon was very much like me. By that, she means he was extremely intelligent, clever, handsome, and winsome. She has told me that if Agamemnon had thumbs, he would be a menace to the world. I wish I had thumbs sometimes. I could open any door and escape any time I want to. That sounds interesting. Debbie’s cat, Oliver, is a Siamese, but the only thing he has in common with me are his handsome good looks. Can you share an excerpt from one of your books that feature you in an important scene? If so, please include it. This is the beginning of the first book when you first meet me. That seems important to me. The butterscotch tabby cat crouched in his soft-sided carrier in the strange room. His nose twitched. This place was full of the smell of fear. He hadn’t eaten for two hours. Time for a decent meal. At least a snack. He clawed at the inside of the zipper. The top flap budged a bit. After he silently worked at it for a few more minutes, the flap opened far enough. Purring, he sprang out. Charity Oliver jumped up from the plastic chair in the examining room and caught her cat. “Quincy! How did you escape?” She stroked him and he twisted his head to lick her hand. “Here, let me, Ms. Oliver.” Nice deep, rumbly voice, she thought. The veterinarian took the cat from her. His strong hands were warm. He cuddled Quincy, who began a steady purr. “Please call me Chase, Dr. Ramos.” Only Anna called her Charity, after all, and hardly anyone called her Ms. Oliver. Dr. Ramos set Quincy on the stainless steel examining table and fished his stethoscope out of his lab coat pocket. After sticking the earpieces into his ears, he bent his dark curls close to the cat to listen to his insides, then palpated Quincy’s stomach. Chase felt bad about the poking and prodding her little darling was enduring, but Quincy didn’t seem to mind it. In fact, he licked the vet’s hand. Very mice scene, Quincy. I act in a vet scene in Between a Rock and a Hard Place, my second adventure, but I must admit that I was not as good a patient as you. – MOL (meow out loud). That everyone loves me and gives me treats when they’re not supposed to. Don’t tell Chase, though! She might cut back on my treats or my din dins. In the second book, I escape at a fall fair and so many people stuff me that I can hardly move. When I find all those butter statues I’m in ecstasy. I don’t know why they get so upset that I’m licking one of them. The man who made it won’t mind. He’s dead on the floor. Mac is very good about giving me treats, and Laura and Donald slip me some, too. Thank goodness I am able to keep my slim physique. Sorry to hear about the murdered man. There’s been a few corpses in my books, as well. Are you a talking cat in your books or just a silent one like I am who just meows occasionally? I never talk in the books, only on blogs and guest appearances. In the book, you can see what I’m doing, but can’t hear my thoughts. I’m a very private cat and prefer it that way. I do meow when I’m hungry. Same here. That’s why I enjoy this blog and when I appear as a monthly guest host on the Cobble Cove Character chat. What advice would you give other cat characters? Always be kind to your human, the one who feeds you. If you don’t, you might not get fed. If your human is looking for a piece of paper that you tucked away somewhere, and you think she would be happy if she found it, I would advise you to claw it out where she can see it. Finding other clues that she needs helps her out, too, and makes her feel good enough to reward me. With treats, of course. I haven’t been rewarded with treats for my help on any of the mysteries, so far, but I will definitely suggest that to my author. She already caved in about letting me on a cover of our upcoming third mystery. The Fat Cat series has ended, but I hear that Janet’s very good friend (and alter-ego) Kaye George will have a new cozy series coming out with Kensington next year. There will be a cat, too! She can’t give you details yet but should be able to soon. Awww, too bad your series is over, but I’ll be sure to check out the new one. Janet blogs on Killer Characters on the 4th day of every month. (http://www.killercharacters.com/) The best posts are the ones she has let me do, of course. She is also a member of the Facebook group, Nose for Trouble, with 4 other cozy writers who have awesome pets in their mysteries. Check it out for cute animal posts. Her own blog is occasional and is called Janet and Quincy, since I’m such an important member of the team. (http://janetcantrell.blogspot.com/). Pawsome. I will definitely take a look at these. Thanks so much for joining me, and don’t worry about the broken chair. It’s only virtual. Best whiskers to Janet on her new series. 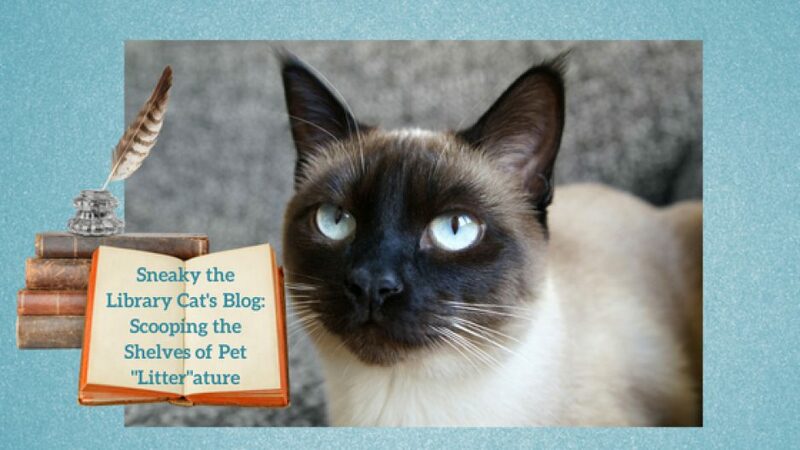 Even though I’m just a character cat who only “speaks” written meows, I admire those real cats who are as talkative as my author’s Siamese, Oliver. Although he’s not in this week’s feature film, you will note that many of his Siamese friends are along with their humans who talk to them. Turn the volume down if you don’t want to hear these noisy kitties and people; but if you listen, you will get quite an earful. Oh, my whiskers! It’s been some time since I’ve had an interview, but I’m very lucky today to have a fellow Siamese cat character here to talk about her series. What is your name and your author’s name, pretty kitty? Mice to meet you, Ling Ling. What book(s) have you appeared in? Please list them and their genre. I first appeared in Mrs. Odboddy Hometown Patriot and then had a lesser role in Mrs. Odboddy Undercover Courie, both set in hometown California during WWII. Pawsome. I love historical mysteries even though my books are in present time. Please give more details about your series. Mrs. Odboddy is an eccentric elderly woman who fights the war (WWII) from the home front and is determined to end conspiracies and bring Nazi spies to justice. In the sequel, she carries a secret package cross country to President Roosevelt by train. Physically, I look like Ling-Ling, a Siamese feral cat that appears at mom’s ‘free soup kitchen’ morning and night, however, I’m a more clever cat than she. All Siamese are smart. I’m based on my author’s cat, Oliver. He is not only smart but has a large vocabulary. Meow! A beige streak raced by Agnes and slipped past Godfrey’s feet as he shoved open the door. Agnes gasped and dashed toward the bathroom. Godfrey might have dealt with a chicken or two during his exhilarating career in the military, but he wasn’t equipped to deal with a cross-eyed Siamese cat on a Black-Ops Death Raid. If a hand grenade had detonated in the bathroom, there couldn’t have been greater chaos. Ling-Ling sprang from the floor to the back of the toilet, and then to the top of the shower curtain. Within the close confines of the bathroom, feathers flew as the six chickens exploded in six different directions. The frightened fowl squawked. Ling-Ling yowled. For a little cat, she was making a grand effort to annihilate the six-pack. Godfrey flung up his hands as a chicken—was it Sophia—flapped into his face, and then to the shoulder pad of his jacket, and onto the top of his head. Chicken Mildred escaped, raced down the hall and turned at the first doorway. Myrtle and Mrs. Whistlemeyer sprinted toward the living room. Clara flapped into the kitchen. Crash! Was that the kettle of oxtail stew hitting the linoleum? So much for dinner! Belly to the floor, Ling-Ling had Abigail by the throat, dragging her kill out the bathroom door, down the hall and into the garage. Godfrey shoved Sophia off his head and raced after Ling-Ling, toward the garage. Katherine followed a trail of pinfeathers into her bedroom. Agnes streaked toward the living room behind Mrs. Whistlemeyer. This had turned into the dinner party from H.E.L.L She burst into giggles. Yes. This ought to dampen Godfrey’s amorous intentions. She should write a piece for Luella Parson’s advice column. Number Two: Open the door and toss in the cat. What a purrfect excerpt, and you are quite the actress or cattress, as the case may be. Agnes adopted me when my former ‘person’, Lilly Jengyu, was taken to a Japanese Internment Camp. Even though I am very naughty at times, Agnes and Katherine forgive me because I’m just so darn cute. Yes, we cat characters have a way of wrapping our protagonists around our fingers. I must speak with Thumper some time. I don’t talk in my books either, but I did get my photo on my upcoming third adventure, Written in Stone. Even if you are a POV cat character and/or narrate part/all of the book, physically stick to what cats can do. They do not have opposable thumbs, and should not walk through walls. Stay true to ones’ true cat nature. Thinking and talking to other animals is acceptable and even desirable at the will of the author. Yes, realism is so important in fiction even for cats. Mrs. Odboddy Undercover Courier was just published last month. A third Mrs. Odboddy is scheduled next year…Mrs. Odboddy – And then There Was a Tiger.. and yes, there is a real live tiger… Also another cozy cat mystery WIP scheduled for late 2018 with part of the mystery taking place in Germany and Austria. Thank you for the interview, Ling Ling, and best whiskers to you and your author on your upcoming books. Yes, Kits, today is that holiday humans celebrate every March 17, so for my feature Friday films, I am showing some St. Patrick’s Day cats. They may not be Irish, but they are cuter than leprechauns.